It’s taken me a long time to learn what God desires of us in biblically honoring our parents. As a little boy I may have understood the meaning of obedience, yet honor always stood as an elusive unknown, nothing more than some archaic term reserved for kings or soldiers returning from war. And while I endeavored to love my parents, honor remained a mystery, something I never knew how to express. Nevertheless, God quickly went to work. When our family had just begun, we were providentially drawn to serve the elderly. Nursing home visitation became a weekly event for over a decade. Glimpses of honor appeared as I recognized God’s plan for the elderly. Not only were our hearts turning to love these beloved seniors, but His Word of Life became reality in a new way. Then, while still a young man with toddlers at my knees, God cast me into the end-of-life care for my mother-in-law and then the in-home care of my father-in-law. Serving as a caregiver, helping my father-in-law shower and simply move around the house quickly taught me that honor, only brought to bear through focused resolve, is a treasure, a deep well of blessing which every man should pursue. Drawn to the Word of God, and seeking to understand the circumstances He had lovingly thrust us into, He revealed to me the true nature of biblical honor and its preeminence in the father-son relationship. Hanging on the cross, with one of his final remaining breaths, Christ’s priority was for his mother. He stopped to consider his mother, he paused from the agony to remember her, and even while being tortured he spoke to ensure his mother was cared for and loved the rest of her days. Men, this is honor. We quickly see a stark contrast between simply obeying our parents and honoring them daily. It is the difference between being the nice guy that remembers to call Dad once a week and the son who sacrificially gives hands-on care for his dad in his last days. It’s the difference between the boy who dutifully buys Mom flowers every Mother’s Day and the man who repeatedly comes by her side as she grieves the loss of her husband. Since learning these precepts of honor, I’ve enjoyed years of helping men successfully grow to honor their fathers. However, very often men will tell me, “I can’t, I have no relationship with my dad!” Before I tell you where to begin, let me first share with you the key principal to giving honor. Without it, your efforts to honor will be feeble and even insincere. Any effort to honor our earthly father must begin with a life devoted to honoring our Heavenly Father. Honor starts by fearing God and recognizing that we can only love others because of God’s sacrificial love for us through His Son, Jesus Christ. It is through the recognition of our frailty and utter dependence on Christ that we are enabled to love others, speak the words of life, and truly honor. Before making any attempts to honor others, first take spiritual inventory of your heart and relationship with God. Honoring your father in a lukewarm relationship can be challenging. You may feel ill-equipped, and honoring even may be something you’re tempted to shy away from. Nevertheless, we should do all things well to the glory of God! It is through your identify in Christ that any fear of giving honor will be cast away and you’ll receive God’s power to truly bless. Carefully consider these words of the Apostle Paul to young Timothy. With our focus on God, He gives us power, love, and a sound mind, to restore relationships and selflessly give honor. Once established, we can take steps forward in faith toward honoring, even where a poor father-son relationship exists. While all men are in different places in honoring their parents, the key is simply to move in the “right direction” no matter how big or small the steps. Through prayer, faith in Christ, and a diligence to pursue the relationship, we’ve consistently seen men advance their relationships with their fathers through honor. Don’t seek perfection on Day One, just move toward “better” and pursue more at every opportunity. So what should honor look like? Unfortunately, in today’s culture a common model for honoring parents, even among Christians, accelerates in childhood and at the end of life, but is sporadic in between. In great contrast to the common model, Biblical honor is rapid in youth (exemplified in Proverbs) and increases throughout life, compounding respect, dignity, and reverence to levels higher than the common model will ever attain. It’s important that as men we run after honor and example this for our children and future generations. Consider the message here: children obligated to repay their parents, by showing piety in their home! This is not the “See ya, Mom and Dad” mentality I once knew. No, this can only come through years of honor, respect, and a cultivated relationship. Relationships grow, are bolstered through love, and consequently honor blooms. Moreover, note that provision for parents, and even grandparents is not just expected, but brought with a strong warning. Clearly, honor is paramount in the heart of God. Our culture views our elderly fathers as past their point of usefulness, unproductive to producing something tangible in our materialistic society. However, the Word tells us not only do they have wisdom, which is to be prized above gold, but that declaring the goodness of God is essentially the role of the aged. This is the job of old men--to pass on wisdom to the next generation. Do we honor them by allowing that opportunity? Many today wonder why we see so many youth veering off into laziness, selfishness, and sometimes outright foolishness. Could it be because they’re not receiving the wisdom of men fifty years older than them? Not witnessing the example of war-torn men who have endured spiritual battles for decades? 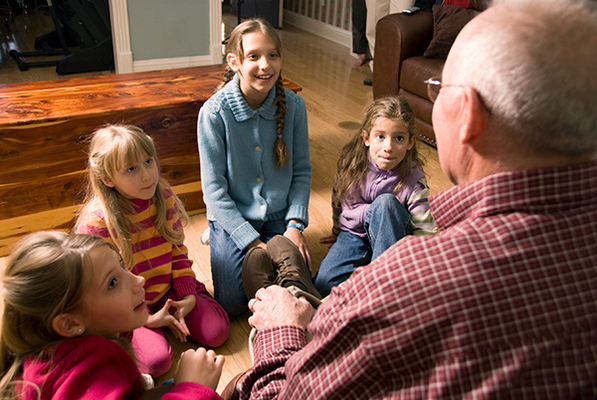 Are they sitting at the feet of their grandparents, seeking to grow in wisdom? It’s time to step forward and take hold of the treasure that awaits us by giving honor. We need to drive honor to the generations by ensuring wisdom is transferred from father to son. Indeed just listening to our father brings honor to him and glorifies God. I encourage you to bring the generations together. Pair up our youth that lack wisdom with those God-fearing veterans who have much to share. May we gain the wisdom from our parents and elders to strengthen the next generation to even greater faith in God. © 2017 by Todd Strawser. Todd and his family share a deep conviction to see the Christian family and church thrive in their biblical roles of caring for the elderly. As an elder in his local church and with over a decade of ministry to the “least of these,” Todd and his wife have ministered in nursing homes for twelve years. They also provided care for his father-in-law and ministered to his mother-in-law through the end-of-life during her fight against lung cancer. Todd is the founder of Christian Family Eldercare and directed the CFE conference in 2015. Todd and his wife Jessica live in Monument, Colorado with their seven children. Know someone who would enjoy this article? Share it with them! Copyright © 2014-2019 by Christian Family Eldercare. All rights reserved.